Before going vegan, I never ever knew how to properly cook meat, fish, or eggs. It was pretty pathetic. But now that I've cut out all animal products, I'm so thankful that I can cook my meals without so much fuss and worry! Here's a guide to several vegan meat substitutes, especially for those of you who are experimenting with a meatless diet or are new to veganism. Made from cooked, pureed, and pressed soybeans, tofu is very versatile. You can use silken (soft) tofu in smoothies and pies, whereas firm selection is a great choice for stir-fry and shish kebabs. When drained out of all the water, tofu marinates very well and absorbs just about every liquid that surrounds it (except oil). Tofu is low in carbohydrates and is a great source of protein (especially tryptophan) and calcium. Tofu is sold refrigerated and at room temperature in TetraPaks. Tempeh is a dense, fermented rice cake that has a grainy texture. Though it has an acquired taste, tempeh can be cooked in many ways to appeal to your palates. High in protein, iron, and manganese, tempeh is wonderful in sandwiches and salads! (Lightlife's Flax tempeh is my favorite choice.) Also, you might find that tempeh is easy to digest since fermentation forms enzymes. Made from the protein found in wheat, seitan has a chewy texture and is an excellent source of protein. You can find seitan in the refrigerated section of your grocery store but you can make your own using vital wheat gluten flour or whole wheat flour in the baking aisle. In addition, Asian markets have a huge variety of wheat gluten, many of which take on the shapes of real meat. Unfortunately, seitan might be hard to digest for some people due to either the high protein content or the fact that seitan is a highly concentrated source of wheat (those with celiac disease or gluten intolerance should NOT consume seitan). Made from soy, textured vegetable protein (TVP) is great to use in stuffed bell peppers, chili, lasagna, shepherd's pie, and anywhere else ground beef is traditionally called for. It's high in protein but the pre-made vegan ground "beef," "deli slices," and soyrizo can be hefty in sodium as well. The packaged, uncooked TVP from Bob's Red Mill is low in sodium so you can prepare your own without too much salt. The cleanliness of TVP is questionable, since some factories use the chemical solvent hexane to produce it. For this reason, you can simply limit your use of TVP, buy organic TVP, or (for a natural alternative) you can use cooked lentils. Lentils are a great source of fiber, protein, folate, iron, and zinc. You can cook them and use them in the same way ground beef/TVP is used (stuffed bell peppers, lasagna, sloppy Joe's and "meat" loafs). Beans are versatile and can be used in salads, soups, chili, and to make (my favorite) bean burgers. 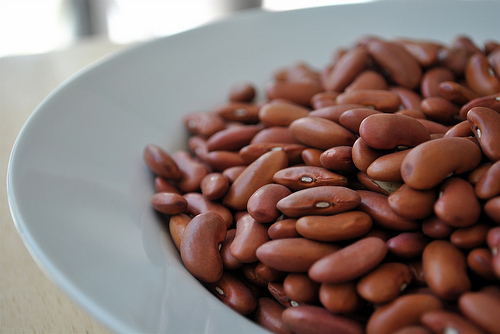 The kind of bean varies in nutritional profile but they are all generally an excellent source of both protein and fiber. Mushrooms are the most natural choice among vegan meat substitutes. Though they aren't highest in protein, mushrooms provide a meaty texture. The cap of the portobello mushroom can be used as a "patty" in burgers, and button mushrooms do very well in shish kebabs. In soups, shiitake mushrooms add a chewy, wholesome texture. You can also make a savory stroganoff sauce to go along with whole wheat pasta. These tasty fungi are low in calories but high in vitamin D (especially portobellos), copper, potassium, selenium, and B vitamins. Eggplant is very similar to mushrooms in that, although low in protein, it contains tons of vitamins and minerals and it also has a meaty texture, especially when cooked. It's great in pasta and stir-fry. Leave the skin on to maintain its antioxidants. Eggplant is a great source of folate, potassium, and manganese. In closing, it's not difficult to get that desired texture in certain foods when eating vegan. However, if you are craving real meat, that probably means you are deficient in a certain mineral. Make sure you're getting enough B12, iron, and zinc, which are all found in meat. Nutritiondata.self.com is a great site to see how the foods you eat stack up in vitamins and minerals.